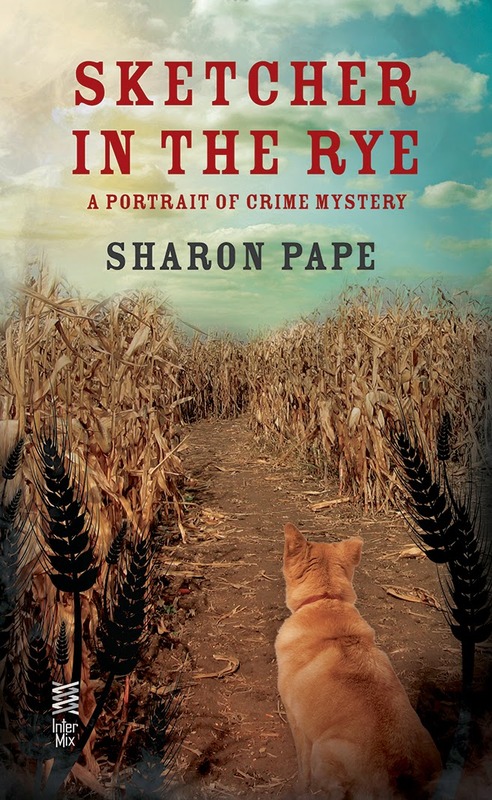 by Hobo from SKETCHER IN THE RYE, the fourth book in the Portrait of Crime Mysteries by Sharon Pape. I want to tell you about yesterday when I almost ran away from my beloved home. Rory's friend, Andrea, came to visit with her new puppy, Henry. First of all, who names a dog Henry? Can you imagine the teasing he'll get in the dog park when she calls for him? Personally, I think dogs should have dog names, not people names. You'll never hear a person name their baby Hobo or Fluffy or Spot. Well, maybe a celebrity would. But now I'm getting off topic. Where was I? Oh, right - Henry. I was looking forward to meeting the little fellow. It had been quite a while since I'd spent quality time with someone of my species. My misgivings began as soon as Andrea came into the house and set the squirming Henry on the floor. Granted, I hadn't been around a three month old since I was about that age, but I don't think I've ever seen anything like Henry. He tore through the house like a teeny tornado, bouncing off walls, colliding with furniture and stumbling over his own feet. I got dizzy just watching him. Then he came racing back to where we adults were standing and tried to jump up to grab my whiskers, which he failed to do, and the long fur of my tail, which he succeeded in doing, to my dismay. I was relieved when the ladies finally settled themselves in the living room. Maybe Henry would take a nap. I lay down on the floor and closed my eyes to show Henry what he should be doing while our people talked. But he turned out to be a slow learner. He jumped onto my back, scampered onto my head and slid down my muzzle. It didn't hurt, but hey, I'm a dog, not a Jungle Gym. My Rory tried to help by picking him up and holding him on her lap. But he just kept wiggling out of her grasp. Andrea tried the same thing with the same results. I'm generally an easy going kind of dog, but I finally lost my patience with Henry and barked at him. I barked so loudly that he staggered backward from the sheer force of the sound. The ladies were startled too. "Oh, poor Hobo," Andrea said, coming to scratch around my ears. "I think it's time for me to take Henry home." With those words, she became one of my favorite people, after my Rory of course and the marshal, and Rory's family and I certainly can't forget Eloise and Olga. In any case, I learned a lesson from their visit. Sometimes you have to speak up for yourself. That night my Rory gave me extra cuddles and a big, juicy hamburger for dinner. She said it was my reward for tolerating Henry for as long as I did. You know, maybe it wouldn't be so bad if Henry came back for another visit. I'd like to tell you about yesterday when I almost ran away from my beloved home. Rory's friend, Andrea, came to visit with her new puppy, Henry. First of all, who names a dog Henry? Can you imagine the teasing he'll get in the dog park when she calls for him? Personally, I think dogs should have dog names, not people names. You'll never hear a person name their baby Hobo or Fluffy or Spot. Well, maybe a celebrity would. But now I'm getting off topic. Where was I? Oh, right - Henry. I was looking forward to meeting the little fellow. It had been quite a while since I'd spent quality time with another of my species. My misgivings began as soon as Andrea came into the house and set the squirming Henry on the floor. Granted, I hadn't been around a three month old since I was about that age, but I don't think I've ever seen anything like Henry. He tore through the house like a teeny tornado, bouncing off walls, colliding with furniture and stumbling over his own feet. I got dizzy just watching him. Then he came racing back to where we adults were standing and tried to jump up to grab my whiskers, which he failed to do, and the long fur of my tail, which he succeeded in doing, to my dismay. I was relieved when the ladies finally settled themselves in the living room. Maybe Henry would take a nap. I lay down on the floor and closed my eyes to show Henry what he should be doing while our people talked. But he turned out to be a slow learner. He jumped onto my back, scampered onto my head and slid down my muzzle. It didn't hurt, but hey, I'm a dog, not a Jungle Gym. My Rory tried to help by picking him up and holding him on her lap. But he just kept wiggling out of her grasp. Andrea tried the same thing with the same results. I'm generally an easy going kind of dog, but I finally lost my patience with Henry and barked at him. I barked so loudly that he seemed to stagger backward from the sheer force of the sound. I could see that the ladies were startled too. "Oh, poor Hobo," Andrea said, scratching around my ears. "I think it's time for me to take Henry home." With those words, she became one of my favorite people, after my Rory of course and the marshal, and Rory's family and I certainly can't forget Eloise and Olga. In any case, I learned a lesson from their visit. Sometimes you have to speak up for yourself. That night my Rory gave me extra cuddles and a big, juicy hamburger for dinner. She said it was my reward for tolerating Henry for as long as I did. You know, maybe it wouldn't be so bad if Henry came back for another visit.